Today I'm sharing a card that uses the new Good Friends stamp set and Dies. This stamp set & Dies are exclusively designed to Ellen Hutson by MFT as part of their United We Flourish campaign, and they are now available for purchase at Ellen Hutson! It's an adorable pet themed set and I'm sure you'll love it! I was inspired by my team mate, Laurie Willison to create this card. She shared an easy and quick way to create a spinner card using the Circle Shaker Pouch and the Merry Christmas Circle Frame Die-namics. I loved her idea so much and had to give it a try! You can see her blog post HERE and her tutorial video HERE. I also have a tutorial video. Click HERE to watch it on YouTube. Visit the MFT blog and the Ellen Hutson blog for more information about this stamp set! It's time for a Creative Construction with Blueprints Challenge over at the MFT Challenge & Inspiration blog. This month's theme is Right This Way - we're challenged to use the directional elements from MFT Blueprints collection. First I decided to play with the Written in the Stars stamp set and the Shinning Stars Die-namics, and wanted to lead recipient's eyes towards the upside to match with the sentiment. So I decided to use the chevron elements from the Blueprints 32 Die-namics and added a few rectangle elements from the Blueprints 13 & 32 to emphasize the vertical visual line. To create my background, I lightly stenciled the Abstract pattern with Grout Gray ink using a stencil brush and added some faux gold ink spatters using the Distress Patterns stamp set. I die cut three "Stars" from After Midnight CS and one from Smooth White CS. I slightly inked the lower one third of the white one with Peach Bellini ink. I stacked and glued them together, the white one was on top and a little bit off-set for a shadow effect. Head on over to the MFT Challenge & Inspiration blog for the challenge details and for more inspiration from the DT. Remember you have a chance to win a $50 gift voucher by participating the challenge. It's time to shop! The new Snowflake Splendor Card Kit is available for purchase now!! I have one more card to share with you that I made using the new kit. I kept the design clean so that my snowflake took the stage. I made my frames with Smooth White, Sno Cone, and Summer Splash card stock using the stacked die cutting technique. I stamped the top panel with the Balloon Strings Background and heat embossed a sentiment from the Snowfall of Blessings stamp set with Silver embossing powder. Thank you for stopping by. Happy shopping!! Welcome to Day 2 of the MFT Snowflake Splendor Card Kit Countdown. The new kit will be available for purchase tonight at 9:00 pm EDT! Today I paired the kit with the Happy Pawlidays stamp set. To create my background panel, I inked a Spearmint panel with Spearmint Premium Dye ink, spattered it with white ink, then cut it with the Snow Drifts Cover-Up Die-namics. I cut two more Snow Drifts Cover-Ups out of Spearmint CS, stacked them on a Smooth White card base, and inlaid the inked interior pieces. I gold embossed a sentiment from the Happy Pawlidays stamp set on one of the interior pieces. It's Day 1 of the MFT October Card Kit Countdown. This month's kit is all about snowflakes!! It is really beautiful and versatile. I'm sure you'll love it! Make sure you stop by the MFT blog today and tomorrow for the full reveal of the kit and for more inspiration from the DT. My card for today features the Snowflake Splendor stamp set. First I cut a Smooth White panel using the Triple Peek-a-Boo Window & Edge Die-namics and stamped three large snowflakes. Then I added a pierced line on top of each snowflake using the Basic Stitch Lines Die-namics so they look like hanging down from the top. I stamped the smaller snowflakes, added a border of Silver Sparkle card stock, and adhered to a Bubblegum card base with foam tape. I also added a die-cut "joy", which I slightly sponged with Summer Splash Premium Dye ink. I added some tiny silver dots with Silver Moondust Glitter Drops to finish off the card. The new Snowflake Splendor Card Kit will be available for purchase tomorrow at 9:00 pm EDT. It's always so fun adding some handmade decorations to your Christmas tree or your cozy room. Right? With the new Scenic Snow Globe Die-namics, you can create cute snow globes easily. Here is a trick of the suspended sentiment panel. I adhered all the die cut elements to a panel of acetate. It's time to shop! 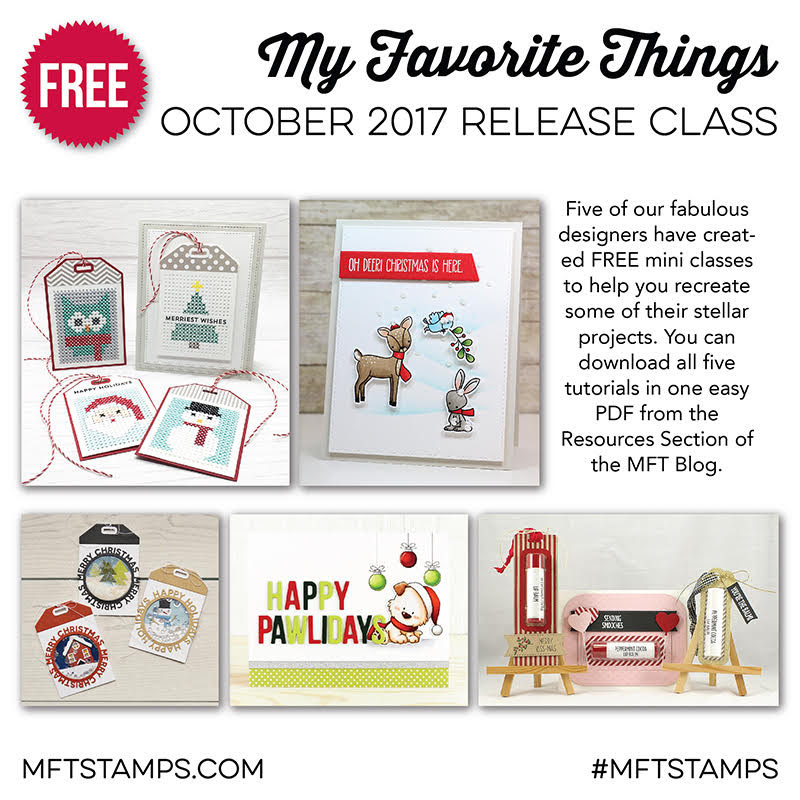 MFT October Release is live now! I'd like to share a card with you that I made for this month's Release Class using the Happy Pawlidays stamp set. I used the Happy Wonderful Christmas Die-namics to spell "HAPPY PAWLIDAYS". Check out the October Release Class to see how I made this card in a downloadable PDF. It's final day of the MFT October Release Countdown. All the new products will be available for purchase TONIGHT at 9:00 pm EDT! I've shared four winter/Christmas cards with you this past four days. I went back to the autumn mood again to create today's card. I combined the X's and O's stamp set with the adorable critters from the Wild Woodland stamp set that was released last month, and created a scene where the squirrel and owl are playing tic-tac-toe using acorns and leaves. It's Day 2 of the MFT October Release Countdown. We're so close to the release day! All the new products will be available for purchase tomorrow at 9:00 pm EDT! My card for today uses the Handwritten Holiday stamp set and the Scenic Globe Die-namics. My main panel was cut with the new A2 Stitched Rectangle STAX Set 1 Die-namics, which must be another my "go-to" Die-namics! I created my night sky by ink blending (the ink colors are listed at the bottom of this blog post) and drew falling snow with a white gel pen. Welcome to Day 3 of the MFT October Release Countdown. Today I have a shaker card to share with you that features the Dashing Deer stamp set & Die-namics. To create my background scene, I cut Periwinkle CS, blended Periwinkle and Boysenberry Premium Dye inks, spattered some white ink over it with a paint brush, and added a snowy hill panel and birch trees.